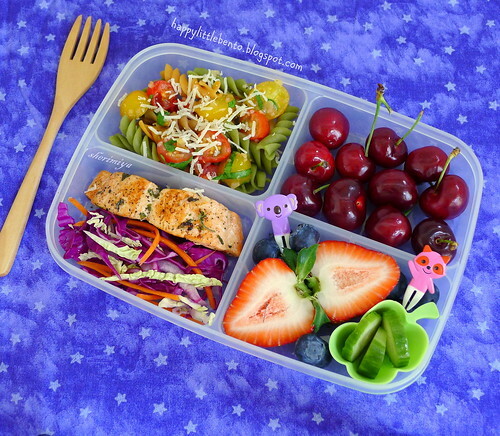 Salmon, Tomato Relish, and Slaw Bento, a photo by sherimiya ♥ on Flickr. Today I made TinySprite a compartmentalized bento, so I could give her a little bit of several different things. I find that she's more likely to finish everything if there isn't too much of it. She gets a piece of king salmon, pan-fried in olive oil, pepper, and parsley, served beside a red cabbage/savoy cabbage/carrot/onion slaw. Since she loves pasta, I also gave her some tricolor rotini topped with cherry tomato/shallot/garlic "relish" and shaved parmesan. I squeezed some cherries, blueberries and a halved strawberry in the rest of the sections, along with a couple of pickled cucumbers. The four dividers keep everything separate, and since there's no sauce in this bento either, there shouldn't be any crossover leakage. Hope she enjoys this one! Stunning bento. The colours are beautiful.